Sussex is seeing a property boom. Be you a commuter wanting a little more space and greenery – or Paul McCartney (who owns property in the county) – Sussex and its south coast is becoming the popular place to be. From the rustic charms of Rye next to picturesque Camber Sands through to funky Brighton, young professionals are increasingly prepared to look further afield to avoid the huge London premiums. For the third year running according to Lloyds bank, Hove tops the table for England and Wales for the most homes sold to young professions (defined as a 25 – 44 demographic). Hastings has been called, “the Shoreditch of Sussex” in more than one magazine. Whilst Sussex has a downside: the requirement to push through south London’s suburban sprawl to reach it, opting to accept a slightly longer commute does open up a raft of property options. Historic and picture postcard- esque villages such as Amberley or Plasitow can be considered or should you wish to remain on the coast Eastbourne, Brighton, Hove and Hastings provide both amenities, culture and transport hubs. Given one of the main reasons traditional young professional areas of London such as Wandsworth, Wimbledon and Hampstead have remained popular is access to local open space for fitness and recreation, Sussex does very well allowing young professional buyers scope to pursue the outdoor life. From the High Weald area of natural beauty to the eastern edge of the South Downs behind Brighton and Eastbourne, there is ample opportunity for lazy walkers or weekend warrior cyclists to get out and unwind. Those not of the lycra clad persuasion, can at least benefit from being near to the surge in both production and popularity of English sparkling wine. From the well know sparkling brands Nyetimber and Ridgeview in West Sussex to the less well known Black Dog Hill vineyard and Rathfinny Wine estate to the north west of Eastbourne, there is plenty to tantalise the taste buds for lazy Saturday afternoons. Transport is clearly key in driving young commuters to new areas and over the past decade, the south coast and interior of the county have benefitted from better rail links and the roll out of super-fast broadband. Rye and the surrounding area of East Sussex has long had a strong second home market but according to a number of local estate agents, the improved infrastructure is making to region highly attractive to main buyers; high speed trains from Ashford International to St Pancreas take 37 minutes. The average house price is nearly £300,000 less than London. 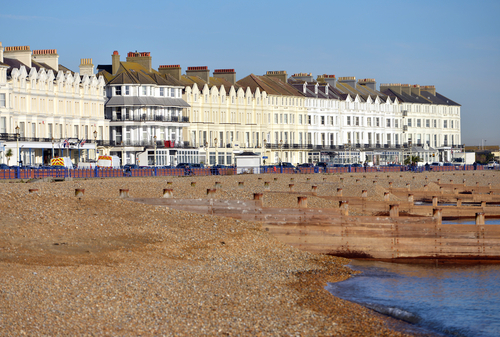 In Hove, research by Lloyds Bank has calculated young professionals paid nearly £32,000 less than the average price paid nearby pointing to further anticipated growth in neighbouring towns. The bank’s report points to the closeness to the sea, good sized homes and less frenetic atmosphere than Brighton – though the town is next door should you wish to indulge – for drawing professionals keen to lay down long term roots whilst avoiding the premium of popular areas of Brighton and the surrounding countryside. Overall though, given how professionals congregate and their preparedness to pay that premium to live alongside fellow well qualified and high performing peers expect strong growth in this neck of the woods along the coast. If you are interested in finding out more about our Eastbourne Property please click here.